Israeli security forces shot dead two Palestinians who had gone on a stabbing spree along a popular walkway in Jerusalem on Wednesday in what police described as a terrorist attack. A wave of violence in Israel and the Israeli-occupied West Bank which began almost three months ago has shown no sign of dying down and has sparked concern of wider escalation, a decade after the last Palestinian uprising subsided. 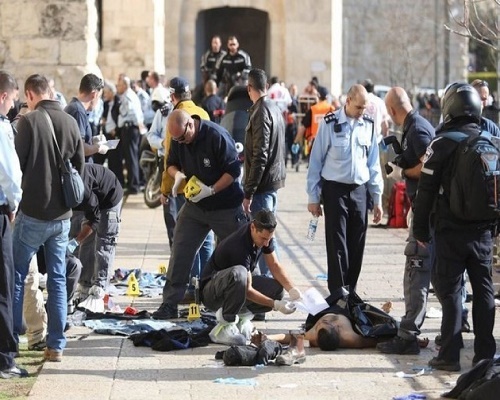 Wednesday’s stabbings took place right outside the Jaffa Gate, one of the main entrances to Jerusalem’s walled Old City. “Paramilitary border policewomen saw terrorists armed with knives stabbing a man,” Israeli police spokeswoman Luba Samri said. “They fired toward the terrorists and neutralized them.” She added that the two Palestinians were killed. Three people were seriously wounded in the incident, the Israeli ambulance service said. Samri said one of the people wounded had apparently been hurt by police gunfire aimed at the stabbers. She said the assailants were from the occupied West Bank and local mosques mourned their deaths. Police was investigating a video which had surfaced on social media which appeared to show a man beating one of the shot assailants with a pole, Jerusalem police spokesman Asi Aharoni told Army Radio. Almost daily stabbings, shootings and car-rammings by Palestinians have killed 19 Israelis and a U.S. citizen since October. Israeli forces or armed civilians have killed at least 118 Palestinians, 70 of whom authorities described as assailants, while others died in clashes with security forces. The surge in violence has been partly fueled by Palestinian frustration over the collapse of U.S.-sponsored peace talks in 2014, the growth of Jewish settlements on land they seek for a future state and Islamist calls for the destruction of Israel. Bloodshed has also been triggered by Muslim opposition to stepped-up Israeli access to Jerusalem’s al Aqsa mosque complex, which many Jews revere as a vestige of their biblical temples and is also Islam’s holiest site outside Saudi Arabia.